War Machine is ready for action! 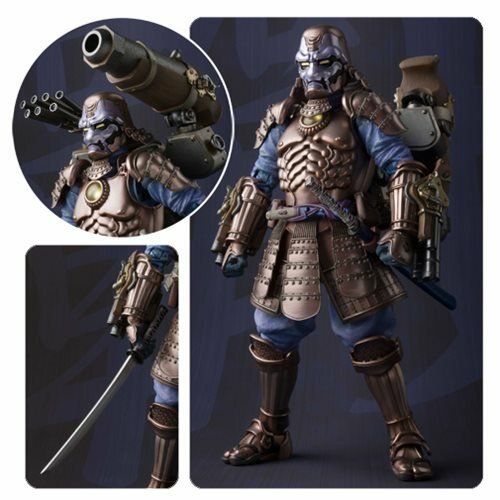 The Marvel Koutetsu Samurai War Machine Meisho Manga Realization Action Figure P-Bandai Tamashii Exclusive was designed by Takeyuki Takeya and sculpted by Junichi Taniguchi and Takashi Yamaguchi! Their masterful skills have re-envisioned War Machine as it might have appeared in the era of samurai. The figure includes 2x pairs of optional hands, sword, backpack, and a stand. Measures about 6 9/10-inches tall. Ages 15 and up.